Well, it’s been a long time since I touched this drama. That’s what I get for peeking at the end before I had watched it all the way through. I won’t spoil the ending now, but I am sure you can guess after the first 5 episodes, that it won’t be a happy one. That being said, Kim Yoo Jung and Seo Shin Ae both received best actress awards for a child actor at the KBS Drama Awards 2010 for their respective roles in this drama. So congratulations to them – their acting really was superb in this drama. As always, the plot to kill Yeon continues on with the help of Yang and Man Shin while Yoon hesitates as he doesn’t want either his daughter nor Yeon to die. Cho Ok worsens as her and Yeon’s birthday draws near. Will Lord Yoon sacrifice Yeon to save Cho Ok, or will he sacrifice Cho Ok to save Yeon? Yeon Yi rushes over to her mother who has just left the house. Awkward. Yeon Yi is frightened of the shaman and the shaman and San Daek have an interesting staring contest. Doo Soo, knowing how potentially bad the situation could get, introduces the shaman as a feng shui master. The shaman glances over at Doo Soo who then goes on to say he called the man there to look at the feng shui of the house thinking that could be the reason so many bad things happen. The shaman smiles and tells them he will see the two women later, so until then, they need to be well. The shaman then follows Doo Soo into his office while San Daek watches with narrowed eyes. She obviously doesn’t believe his story. She then tells Yeon to go with her as it is okay now. Once Doo Soo is alone with the shaman, he immediately balls him out for coming to his house. Man Shin smiles and asks if he has done anything wrong – as if he doesn’t know. Doo Soo asks what Man Shin is doing there and what did he do to Yeon. Man Shin said he gave the little girl traveling money – won’t she be needing that in the afterlife? Doo Soo immediately tells him to lower his voice as anyone could overhear. Man Shin asks if Doo Soo is worried about the mother learning about Doo Soo’s dastardly plan (which he is only plotting thanks to Man Shin’s advice). This angers Doo Soo who, like I said, is only doing this because Man Shin says it is the only way to save his daughter. Man Shin then asks what Doo Soo plans on doing about San Daek. Doo Soo asks why, is something wrong? Man Shin replies there isn’t and then says what mother wouldn’t die if her daughter’s life is in danger. Back in their room, Yeon is sniffing the scraps of cloth saying that she smells blood, rotting animals and decay. The smell came from Man Shin and now seems to have attached itself to Yeon, who is very unhappy by this. San Daek takes her daughter’s hands and says it will be okay after a night. Yeon then asks why Man Shin looked at her as if he knew her since long ago. San Daek holds her daughter and tells her not to worry as her mother is next to her. Yeon snuggles into her mother who then notices the coins clutched in Yeon’s hands. San Daek asks where she got them and Yeon explains that she got the coins from his excellency earlier. Man Shin is leaving the Yoon household and his approached by an unhappy San Daek who holds out the coins and tells him that it is not a gift they can accept lightly. Man Shin replies that he gave them to Yeon because she was cute. San Daek then asks who Man Shin is. Man Shin repeats the questions and smiles. He then says it seems like he made a mistake and he says he will take the coins back. San Daek, careful not to touch him, drops the coins into his outstretched hands. Man Shin then turns and walks away. Is San Daek’s gumiho senses tingling? Is there more to Man Shin than what meets the eye? The next day, Jung Kyu’s servant comes running up to Yeon, begging her to save his young master. Yeon then goes to where Jung Kyu is beating targets without resting. Yeon calls out to him and he turns, happy to see her. Jung Kyu calls her name and then his practice sword slips from his grasp. Yeon looks down and notices his hand is blistered and bleeding. Yeon sits him down and carefully tends his hand, asking him why he practiced the sword so hard that even his hands are bleeding. Instead of answering, Jung Kyu says he is all right and asks how Yeon is doing. Yeon asks what he means and Jung Kyu explains he heard she met with an accident and he hates himself for not being able to help her at all (so sweet and cute – a warm and fuzzy puppy love). Jung Kyu then mentions that when they were attacked in the barley field, it was Yeon who saved him. Jung Kyu then says he will not be a man who saves with his mouth alone. He will work hard to become a man who can protect her. Awww! Yeon, with tears in her eyes, thanks him and then tells him she can’t see him again, giving him is present back. Jung Kyu immediately demand to know why. Jung Kyu wonders if it is because of their class difference. Does Yeon think he will look down on her because she is from a lower class? Yeon shakes her head and says that is not it. Jung Kyu says that no matter what Yeon says, he can see her heart and her heart is the same as his. Jung Kyu then says this is frustrating and asks again why Yeon cannot see him. Yeon then says she is different from other people. Jung Kyu replies that she is as she is someone very precious to him. Yeon says that isn’t it. Yeon, not knowing how to tell him she is a fox, says she has a strange disease and quickly says that she may have been a monster from the very beginning. Jung Kyu then asks if Yeon hates him that much. This surprises Yeon. Jung Kyu then replies that if she didn’t hate him, then why would she say such preposterous things. Yeon says she isn’t lying and asks why Jung Kyu doesn’t believe her. He sighs and tells her that he would like her even if she is a monster. If Yeon is refusing him because she is a monster, then he would rather be a monster with her. This touches Yeon. Jung Kyu then takes his keychain and breaks it in half. He gives on to Yeon promising that no matter what happens or where they are in the world, they will be together forever! Tear. So cute, so sappy, how I want them to be happy. I can’t help but wish this drama would do a leap forward and do the ten year thing between Yeon and Jung Kyu – I think Jung Kyu would definitely be able to do what Yeon’s father failed to do. Jung Kyu then takes the crying Yeon in his arms and holds her, patting her back while she cries. The two then walk down the road smiling and holding hands. They come to a bridge and Jung Kyu breaks into a big grin. Yeon asks why he is smiling and Jung Kyu said that to be honest, he knew Yeon would come looking for him. Yeon asks how he knew and Jung Kyu replies that he saw a lotus flower that looked like Yeon in his dream. Yeon doesn’t believe this and asks how a person’s face can look like a lotus flower. Jung Kyu then grabs her hand and they run onto the bridge. He points to a lotus flower and says “Look, doesn’t that look just like you?” Yeon Smiles and Jung Kyu tells her to wait a moment and rolls up his sleeves. He straddles the railing and reaches for the lotus flower. Yeon tells him to be careful and he says he will be okay, he just wants to get the flower for her. Of course, he falls in. Yeon reaches out for him, but he tells her to stay put as he doesn’t want her to fall in too. Jung Kyu then sinks under water. Yeon screams and watches. Then Jung Kyu resurfaces and manages to grab Yeon’s hand. He the passes out and Yeon goes all foxy to gather the strength to pull him up out of the water. She then tries to get him to wake up. Jung Kyu spits out the water and opens his eyes. He apologizes to Yeon and then is able to see her fox face. He is shocked and backs away. Yeon asks what is wrong and Jung Kyu asks her what that is. Yeon looks down at her hands and quickly turns away from him. Jung Kyu asks if that is what she meant when she said she was different. Yeon says nothing and the shocked Jung Kyu runs away. Drat. Leaving poor Yeon to cry alone and hate herself for being different. That night, Jung Kyu sits alone outside and cries. He recalls Yeon’s fox form as she saved him from drowning. He then remembers when they were attacked by birds and he tried to save her. Yeon is outside crying as well, she hasn’t left the water and just cries and clutches the key chain Jung Kyu broke in half. What will become of our cute young couple? The next day at the Yoon house, Cho Ok is running a terrible fever and her parents sit by her bedside with worry. Cho Ok asks for her father and says that “uncle” keeps telling her to go with him on a boat. Her mother then wants to know how Cho Ok’s deceased uncle could ask such a think. Doo Soo tells her it is only a dream, but Cho Ok asks if she will die soon. Both her parents are unhappy to hear this. Doo Soo tells his daughter that she is not allowed to say such things. Cho Ok asks her uncle if he heard what her father said. Her uncles says no, Cho Ok must ride the boat now. Cho Ok screams and cries and says later, but her dead uncles insists it needs to be now. Yang gets up and rushes out of the room while Doo Soo tries to calm his daughter down. Yang rushes to see Yeon and asks how the funeral shroud for Cho Ok is going. Yang picks up the clothes and sees that no progress has been made. Yang then starts yelling at Yeon, calling her lazy as Cho Ok is dying while Yeon has made no progress to help save her. Then in comes Doo Soo and he yells at his wife for being like that to Yeon. Doo Soo then drags Yang out leaving a crying Yeon looking at the funeral clothes. Doo Soo tells his wife that Yeon has done nothing wrong, but this does not assuage Lady Yang’s hysterics. She asks her husband how he can possibly side with Yeon when Cho Ok is laying in bed, dying. At this moment San Daek arrives and demands to know what is going on. She then tells Lady Yang that it was Yang who begged Yeon to make the funeral clothes and now Yang is pushing Yeon to finish them. Yang then says that San Daek doesn’t understand – those clothes could save Cho Ok’s life. San Daek then says that her daughter almost died – does Yang think San Daek is comfortable watching Yeon make clothes for Cho Ok? This infuriates Yang, but San Daek won’t let her speak and warns the couple that if anything like that happens again, San Daek won’t stay still any longer. San Daek will make her daughter stop sewing the clothes. San Daek then stalks off. Yang demands that her husband do something, but he turns around and walks as way as well. Doo Soo slams his hand down on his table and says that this whole situation is crazy. They have even asked a young girl to make her own burial clothes. Lady Yang says so what. Is Doo Soo not going to finish what he started? Is he just going to let their daughter die? Yang reminds him that he started all of this, but if he can’t finish it, she will. Yang will do anything to ensure that her daughter lives. Yang then gets up and leaves her conflicted husband for conflicted he is. He likes both San Daek and her adorable daughter. He also loves his own daughter and wishes for her to live. What can he do? Someone is getting hurt and dying no matter what. Back in the Gu’s room, Yeon tells her mother she isn’t crying because of the clothes. San Daek then asks why her daughter’s face is like that. Yeon says she is crying because of herself. San Daek asks what she means and Yeon says she wishes she would die as she doesn’t want to live as a monster. San Daek wishes to know what has brought this on and our little girl cries and says that even if someone who likes her sees her like this, the true her, they will run and leave her. San Daek then asks if Jung Kyu saw her – did he see her in the fox state? This freaks San Daek out and she stands up. Yeon asks what is going on and her mother tells her to wait and not go anywhere. I think this worries Yeon. As it should because San Daek goes into a store house where she picks up a knife! Don’t tell me she’s going to try to kill Jung Kyu? San Daek stares at the knife, eyes getting big and wild, before she rushes out of the house. She does not notices that little Yeon is following her. Yeon rushes through the town calling for her mother. San Daek quickly reaches the Jo household and jumps the fence, eyes gone foxy. She hides behind a tree where she hears he daughter call out to her. Shocked, San Daek whirls around, her eyes bleeding back to normal human eyes. She asks how her daughter managed to follow her there and quickly pulls her down out of sight. Yeon then asks what her mother planned on doing coming to the Jo house. San Daek then scolds Yeon for not listening to her. Yeon then says that if her mother meets with Jung Kyu, then Yeon won’t be able to live. San Daek then tells Yeon that she doesn’t know how big a deal it is that her disease has been exposed. What if Jung Kyu tells someone else? Yeon adamantly insists that he would never tell. San Daek tells her daughter that she can’t know that as Yeon doesn’t know how horrible humans are. Yeon stands firm and insists that Jung Kyu is not like that at all (she is right – if he was, he would have blabbed it already). San Daek then tells her daughter she could die because of this. This shocks Yeon. San Daek tells her daughter to go back. Yeon jumps up and San Daek drops the knife. San Daek picks it up and Yeon asks what it is for. San Daek tells her to leave and Yeon begs her mother to spare Jung Kyu’s life. San Daek says she absolutely can’t. Yeon begs her again. Don’t spare his life because Yeon likes him, but spare it because Yeon doesn’t want to be responsible for her mother doing “bad” things! Speak of the devil, at this moment Jung Kyu arrives and overhears the two talking. Yeon then tells her mother that she will never see Jung Kyu again – besides he is too scared of her to want to see her anyways. Jung Kyu definitely seems unhappy to hear this. Yeon then says she will do whatever her mother says. They can leave after she finishes the clothes right? Yeon will work hard to finish the clothes quickly so they can leave – just please don’t hurt young master. San Daek drops the knife and holds her crying daughter. What does Jung Kyu think of all of this? Back at the Yoon household, Yeon works diligently to hurry and finish Cho Ok’s funeral clothes. She cries and sniffles as she sews as fast as she can. our poor little fox child. Lady Yang watches the girl’s crying and sewing silhouette, satisfied that progress is finally being made. When San Daek goes back to their room, she cries as she sees her sleeping daughter’s tear streaked face. How her daughter suffers and there is nothing she can do about it. The next day, nightmares continue to plague Cho OK. She keeps seeing her dead uncle.She asks why he is there and he says he has come to bring her silk clothes. This brightens up the ill Cho Ok and she quickly follows her uncle to get the clothes (her maid is too busy snoozing to realize that Cho Ok has left the room). Cho Ok does not even put on her shoes and sludges through mud following her uncle to a place where she sees beautiful embroidered silk cloth (although there is nothing there – she is just hallucinating). Cho Ok then wonders into the Gu’s room, shocking Yeon. Cho Ok takes the clothes and puts them on. She smiles and thanks her uncle, saying the clothes are so beautiful. The alarmed Yeon asks why Cho Ok is behaving in such a way. Cho Ok ignores her and keeps dancing around in the funeral clothes (which she sees as a beautifully colored silk gown). At this moment, Yoon and Yang arrive and find Cho Ok in her weird state. San Daek demands to know what is going on and Yeon says that Cho Ok came in and asked to try on the clothes. When her mother tells her to take the clothes off and goes to help Cho Ok do it, Cho Ok starts screaming and freaking out as she sees five pale people dressed all in black surrounding her. The girl then throws a fit and starts foaming at the mouth while San Daek and Yeon watch on, horrified. Cho Ok is back in her room where San Daek examines her and Yoon and Lady Yang watch on. San Daek says that Cho Ok has lost a lot of strength. San Daek calmed the little girl by utilizing various pressure points, so Cho Ok shouldn’t get very sick. Yang cries and looks at her poor baby and Yoon looks uncomfortable. Yeon takes the funeral clothes to Doo Soo and says that she has finished them. This surprises Doo Soo who cannot believe she has finished them so quickly. Yeon tells him that after seeing Cho Ok in such a state, Yeon felt she had to finish the clothes quickly. This way Cho Ok will live right? Yoon says it must have been hard on poor Yeon as her face looks haggard. Yoon then touches her hand and apologizes for neglecting her. This seems to set off warning bells for little Yeon. [At this time, Lady Yang is rushing – to see Doo Soo?] Yoon then tells Yeon that he made San Daek a promise when the two came to live at his house. What promise? Doo Soo promised to raise Yeon as his own daughter. Yeon asks how he can say that when he has Cho Ok? Lady Yang overhears this and stands outside, unhappy while Yoon keeps apologizing to Yeon. A furious and crazed Yoon goes to visit Man Shin and pleads with the man to know the secret of saving both his daughter and Yeon. Man Shin remains unmoved. Yoon drops his swords and grabs Man Shin by the collar and asks didn’t he see Yeon? Didn’t he see that kind, sweet, and beautiful child? Man Shin then says that Yoon has already become Yeon’s father. Doo Soo asks what said. Man Shin says that Doo Soo’s eyes say that he is Yeon’s father. Yoon then asks why it has to be Yeon. It just has to be a child born on the same day in the same year, right? The kids he called last time were all born on the same day and year as Cho Ok. Maybe his daughter made a mistake – it must be one of them! Yoon desperately wants to believe that Cho Ok made the wrong choice. He then asks why Man Shin says nothing. Man Shin calmly states that Yoon should go and find the children then. Who knows, it may be the child of a noble instead? Doo Soo slowly lets go of Man Shin who then says he will pray for him. Yoon is grasping at straws and we all know this. Yoon stands and stares at the fire, recalling Cho Ok’s fits and receiving the funeral clothes that Yeon made in hopes to save Cho Ok’s life and Cho Ok asking if she is going to die? Yoon then takes the clothes and walks over to the fire? Will he sacrifice Cho Ok and save Yeon? Yoon then throws the newly made clothes on the fire and watches them burn. Needless to say his wife will be even more displeased at this. The next day Yoon sets out to find all the girls who were born at the same day and year only to learn that several of them had passed away! His servant asks if he should check the registrar’s office when a man collapses and his son begs for someone to help save him. Yoon watches as a monk comes and places a hand on the man. Immediately he stops convulsing. The monk then puts something into the man’s mouth. The old man then wakes up immediately. The monk tells the son he used a temporary cure and that the son must find a certain plant to brew and his father will be all right. Sensing hope in this, Yoon asks his servant to hurry and bring the monk over. The monk looks at Cho Ok and Yoon asks how it is. The monk says it is not easy as she is very sick. In fact, prince Jang Hyun had a similar illness when he was younger. The monk confesses he was on his way home to Nak Hyung until fate brought him there. Looks like he was the doctor that was supposed to be coming for awhile. 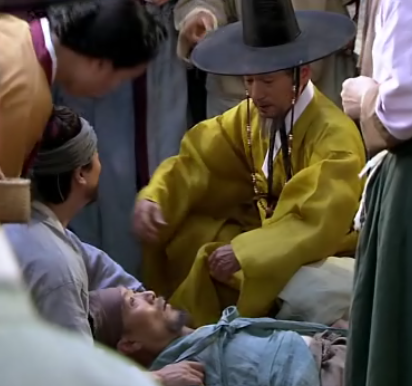 Yoon then asks if the man knows what kind of disease Cho Ok has and then asked what happened to the prince. What medicine was used? The monk asks if either of them know the lingzhi mushroom, which they don’t. Will that mushroom be able to save Cho Ok’s life? I have this feeling this so-called doctor just might be a conman of sorts, but who knows? Yoon goes to leave and Lady Yang rushes out after him to ask if he is going. Yoon replies that since the monk has told him where to get the mushroom, he will go and fetch it. Yang tells him to send Oh, but Yoon says as Cho Ok’s father, he cannot entrust the cure to some lowly servant. Yang then says the day is tomorrow [Cho Ok’s and Yeon’s birthday]. What if Yang doesn’t make it back in time? Yoon says that Cho Ok’s life depends on it so no matter what he will make sure to be back by nightfall. Yang is less than reassured at this. Yeon is, meanwhile, busily packing her things. She unfolds a picture she made of Doo Soo and San Daek asks if it is that sad to leave Yoon. Yeon says that it is and asks if San Daek doesn’t feel that way as well? San Daek says nothing, but goes to seek Doo Soo out. She finds him preparing to go out and she warns him that the nights fall earlier and he has still not completely healed. Yoon says that he has heard there might be a medicine good for Cho Ok. He smiles and tells San Daek not to worry because it isn’t far. He goes to leave and San Daek hugs his back, tears in her eyes. Yoon asks if anything is wrong and San Daek replies that there is nothing. Yoon asks why she is like that and San Daek replies that she will never forget his kindness to her and Yeon. Yoon turns and wipes away a tear and asks why she says such nonsense. San Daek then tightens the bow on Yoon’s clothes. He stills her hands and she says that she used to believe that humans were never to be trusted, but now she knows there are good people like him. Yoon smiles at this and San Daek apologizes for holding him back when he is very busy. Yoon then hugs her and says that it may be only one night, but his heart is heavy to leave San Daek and Yeon. Yoon tells her to take good care of Yeon as he will be back tomorrow night. San Daek silently cries and wishes for him to take care of himself. Her way of saying goodbye I suppose. As Yoon rides off, Jo learns that Yoon is looking for a child born on the same day and time as Cho Ok and you can tell he finds this suspicious. Meanwhile, back at the Yoon place, Yeon goes out to find our loveable mute Chun Woo. She hands him a hand-made pouch in thanks for everything he has done. Chun Woo smiles and shakes his head, probably meaning that it was nothing. Yeon then thanks him for everything and then presses the bag in his hand. You know that Chun Woo has probably figured out that Yeon and her mom are leaving thanks to Yeon’s thank you, present, and how she will never forget him. Chun Woo then goes and watches San Daek while hiding behind a column. As Yeon goes back to the Yoon house she runs into Jo. He smiles and tells her that she doesn’t need to be frightened. Yeah, right. After all the crap he’s pulled. Jo asks why she is empty handed today. This surprises Yeon and Jo elaborates that last time he saw her, she was making funeral clothes. Yeon says that she has finished them already and Jo says she has great filial piety. Confused, Yeon asks what he means. Jo replies that funeral clothes are generally made by children to prevent their parents from dying, thus San Daek has a really wonderful and devoted daughter. Yeon says that it isn’t for her mother, but for Cho Ok. Jo then wonders why Yeon would be asked to make them when there is all those servants there who could do it instead. Yeon says she was told that she must do it to save Cho Ok’s life. Jo asks what that means and Yeon replies that she was told she was Cho Ok’s root. Jo then says he thinks he heard that from Yoon. Yeon, again surprised, asks what he means. Jo then asks after Yeon’s birthdate and confirms that it is indeed the same as Cho Ok’s. Looks like Jo has an idea of what Yoon is planning and has come to investigate. Lady Yang then walks out and Jo quickly tells little Yeon that if anything should happen she must immediately come to his office. Ah, he is actually being nice and would save her after nearly beating her to death himself? But I don’t believe he is that pure. He doesn’t like Yoon all that much and probably just wants to see Yoon fall. Yang comes over and greets Jo. Jo then asks after Yoon’s health. Lady Yang says that Doo Soo has gone away for medicine as Cho Ok is ill. She then send Yeon away and asks why Jo was there. Jo replies that if Yoon was better, he was going to ask him to play a game of checkers. Jo then takes his leave with a smirk. Yep, he definitely knows something is going on. Back at Man Shin’s cave the exorcist wakes up. Man Shin says that he is on the mend now and the exorcist thanks him, saying he will repay him. Man Shin then asks what the man is chasing that he is in such a hurry for. This surprises the exorcist and Man Shin says he senses and insatiable hunger and knows the exorcist is not normal. The exorcist then says Man Shin is right – he catches wicked creatures. The exorcist picks up his things and again says that he will repay the debt. Man Shin asks for his help in grabbing wicked creatures to repay the debt and hands the exorcist a piece of paper written in red (blood or ink, I do not know). Whatever the paper says seems to surprise the exorcist. Back at the Yoon house, Yeon and her mother are getting ready to leave, but San Daek hears something and peaks outside and sees the exorcist. Yeon asks her mother what is wrong. San Daek says nothing, she just has forgotten something. She will go pray and Yeon should wait for her. Yeon goes to stop her, not wanting her mother to leave. San Daek tells her not to worry as she will be back before daybreak and tells her daughter not to come out and just wait for her return. San Daek leaves and confronts the exorcist, saying that she will be leaving the human world in the morning, so the man should leave as she doesn’t want to spill blood now because of him. The exorcist refuses to believe her words and draws his sword. Yeon hears something and worries about her mother. Yeon calls out to her and San Daek’s eyes go back to normal once again. She tells her daughter not to worry and to stay in the room. Yeon, being Yeon, and being worried, of course, heads towards the door to see what is going on. This draws the exorcist’s attention and he smiles. San Daek asks him to fight outside, but he refuses even though he understands its because she doesn’t want Yeon to see her fox form. The fight starts, but San Daek is distracted by her daughter’s questioning if someone came or not. When San Daek starts to turn and Yeon peeks outside, San Daek rushes away to continue the fight elsewhere. San Daek has the upper hand, but is stopped when the exorcist pulls out the paper Man Shin wrote for him and begins chanting. He sticks the paper on San Daek’s clothing and it immediately catches fire and she cannot move. The exorcist then says he won’t bury here where the sun shines and picks up and throws San Daek into the water. Is this the end for San Daek? The next day, Lady Yang prepares to go to Man Shin’s cave. After her servant leaves, she pulls out the funeral clothes and says that no matter how hard Yoon tried to get rid of them, he wouldn’t succeed as she will do whatever it takes. We then cut to Yoon who is at a monastery begging the men to let him see a certain monk as it is a matter of life and death. Meanwhile Cho Ok is doing worse and Man Shin prepares for the ritual. San Daek is still alive and calling silently for her daughter. It looks like Yeon can hear something coming and she is very worried. End episode.